LISTEN to today's featured conversation with Susie Rivo! LOS ANGELES, September 29, 2018 - LEFT ON PEARL, an award winning documentary with “Me,Too” overtones, will be entered into competition at this year’s LAFemme International Film Festival and screen on October 13th@ 8PM at the Regal Cinemas at LA Live in downtown Los Angeles. Director/producer Susie Rivo holds an MFA in Cinema Production from San Francisco State University. Her award-winning short film AMY screened at numerous film festivals, including Sundance and SXSW and was broadcast by WNET, KQED and other PBS stations and in the Czech Republic. She is the recipient of a Massachusetts Cultural Council finalist award for filmmaking. 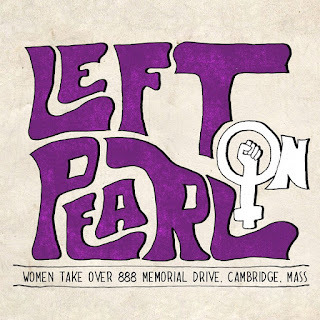 Her documentary LEFT ON PEARL was supported by Mass Humanities, the Puffin Foundation, and a Blaufarb Award from the Tamiment Library at New York University. She is a Resident Scholar at the Women’s Studies Research Center at Brandeis University. LEFT ON PEARL is a fruit of many years of organizing by the 888 Women’s History Project, a non-profit organization formed in 2001. Its members currently include Rochelle Ruthchild, Libby Bouvier, Susan K. Jacoby and Cheryl Stein. Determined to preserve the memory of this pivotal event, Rochelle Ruthchild, an historian, Libby Bouvier, an archivist, and Susan Jacoby, a community activist - formed the 888 Women’s History Project to record interviews and collect related material. They felt compelled, before memories fade even further, to document this transformational moment in women’s history through a documentary, produced and directed by filmmaker Susie Rivo, and edited by Iftach Shavit. For more information on the film or to interview director Susie Rivo, please contact LA Media Consultants, Deborah Gilels at 818-758-6509.